The end of the “Bedside Tables Build” is upon us. I’ve once again been working on them a little longer than I had anticipated, but I have a slew of excuses for that…some actually true too! In today’s episode there’s a lot to cover; from assembling the body to assembling the drawers. 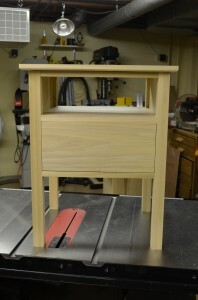 There’s dimensioning and attaching the tops and drawer fronts to a few other things in between. In other words, this is a busy episode! But in the end, the final result is a couple of matching bedside tables for me and Samantha. Finally something that has plenty of room for our stack of bedside reading (iPads and the occasional magazine), a lamp, and maybe even an alarm clock? Not to mention a drawer for hiding midnight snacks and more!!! Hi Matt, great bedside tables. Nice combination of simplicity with a few key design elements. One question: did you have some sort of technique to allow for the top to expand/contract? Actually the one design idea I felt would help with wood movement was to orient the components so they were all lined up in the same direction. The top will expand and contract in the same direction as the sides/legs, shelves, and top rails. So the idea is that the table will breathe in unison year round…fingers crossed. The big 5-0-0…I really cannot believe this is the 500th episode. Wow. The production just keeps getting better and it great that you are showcasing a few more of the tools you’ve acquired. Hopefully, Samantha is happy with the new tables. They look super. Keep those shows coming and if you need any more assistance with the Spoken Wood Podcast please drop me a note. Thanks John, 500 just kind of snuck up on me lol! Excellent series. I really enjoy the project based episodes. Its obvious a lot of the new tools in the basement workshop are inspiring you. Looking forward to what 2013 holds in store. BTW, I am truly sorry about the loss of your special “Woobie”, but I have to say the new SawStop cap is stylin’ and profilin’!!!! Keep Your Mind On Your Fingers And Your Fingers On Your Hands!!! Thank you! I’m trying to narrow it down to one of three or four ideas for the next build. Yes they are! It’s time to stop talking about them and admiring them from the doorway and actually put some wear and tear on them for a change. As for Woobie…a day hasn’t gone by where I’m not convinced he won’t magically appear!